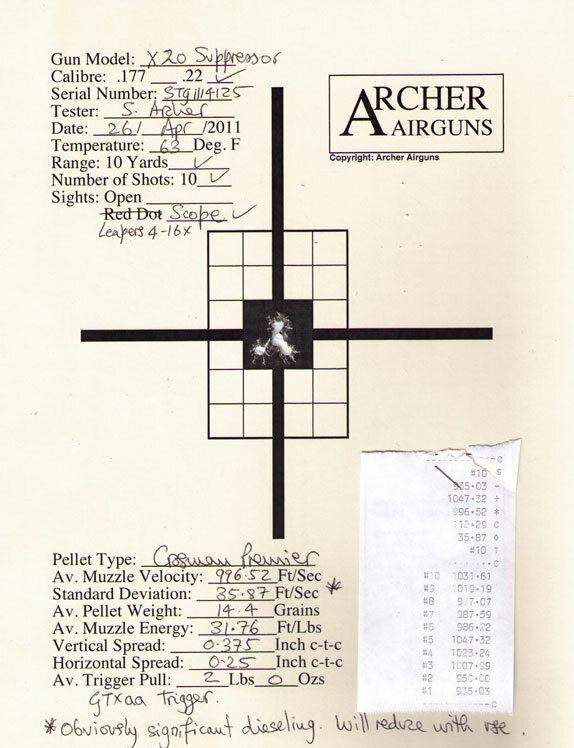 Here's another test target from a .22 caliber Stoeger X20 Suppressor. 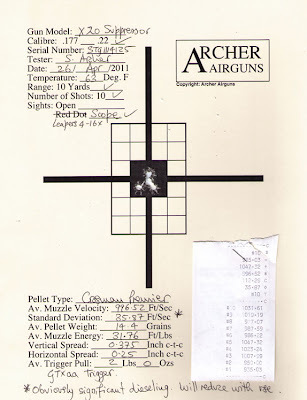 This one was fitted with a GTXaa trigger up-grade and and also with a Leapers 4 - 16 x 50AO scope that Archer Airguns offers, uniquely, as a combo with these Stoeger air rifles. As you can see, this gun was dieseling significantly - hence the very high muzzle energy. But it was still very quiet as the .22 caliber pellets did not exceed the sound barrier. Fitting a GTXaa trigger made a huge difference to the feel of the gun and it certainly helps me to shoot more accurately than with the stadard factory trigger. I'm finding that Crosman Premiers work well in .22 caliber versions of this gun, while Crosman Premier Lights are good in .177 caliber models. Also the Stoeger X-Field pellets work well in both calibers.